As far as I can see, this dress is only sold on one website, which absolutely baffles me, as its so gorgeous! 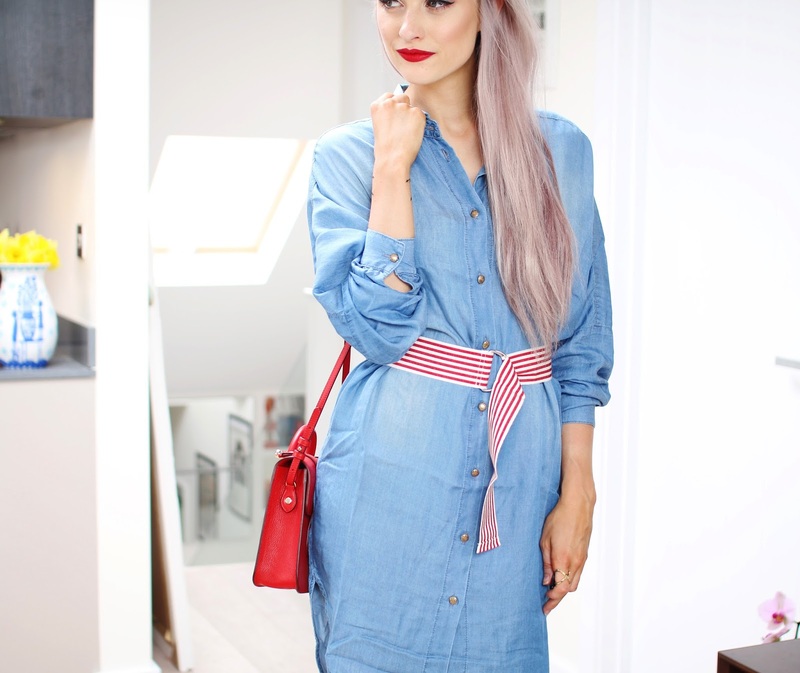 I am more than inspired by the denim shirt trend right now, and this one ticks all of the boxes. A lightweight fabric, detailing to the waist with a pop of colour, a great length and a casual, laid back shape. Plus, when matched with my new Strathberry Mini Tote, the reds work beautiful against the blue. You can dress this casual with a pair of Adidas Superstars or doll it up, with some stilettos and a pointed toe. I am currently dressing for a cool summer, with cover on the shoulders, but a bare leg and heels, with my sunnies strapped to my head most days. But as a further layer, the Bomber jacket from keepsake, in the Ivory satin with beaded embellishment, is an incredible statement piece. I want every other piece from the Keepsake collection that incorporates this bead work.